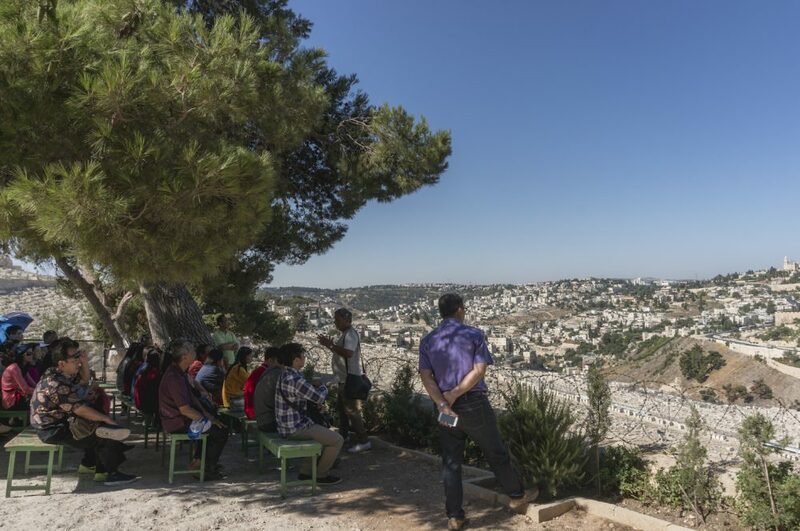 From our last post sharing a story visiting the Mount of Olives, if you haven’t read already. 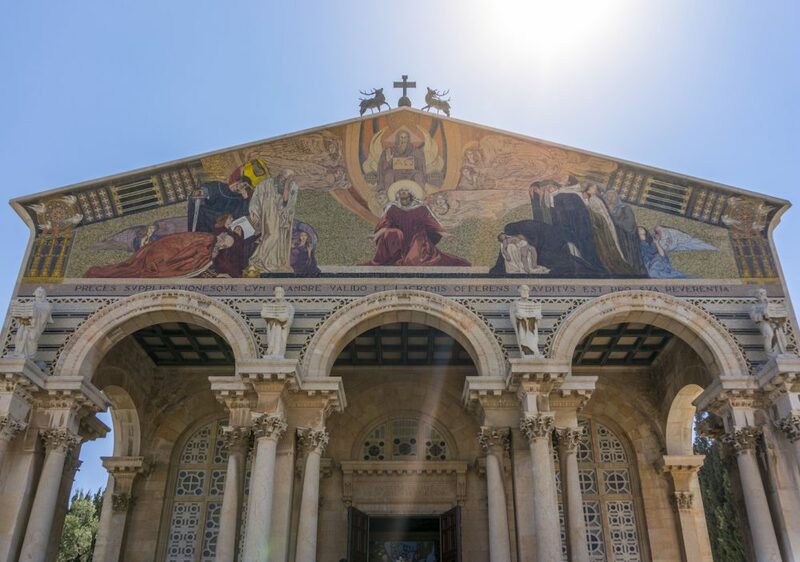 In this post, I will continue the next couple places that we visit ; Church of All Nation and Gethsemane. Still with continuing the walk from the first place that day, the Chapel of Ascension. It surely was one hot day, as the sun rising on top of our head, walking seems unfriendly that day. 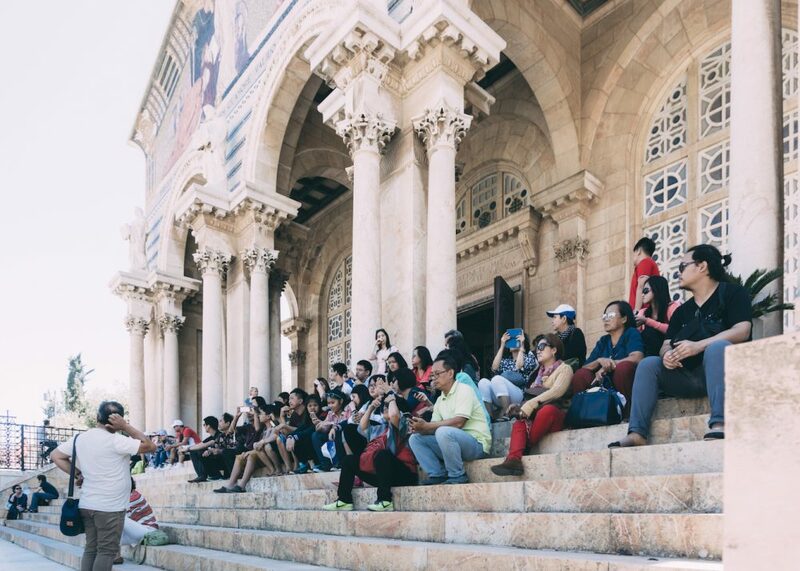 We kept walking down from the higher ground and made our first stop at the Dominus Flevit Church. 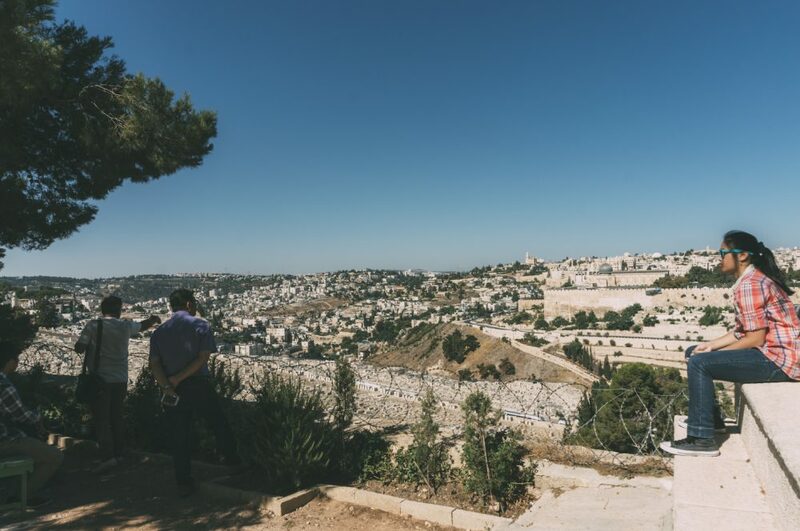 Which to have a short session from Mr. Dani to tell us stories about Jerusalem, especially the old city, the Temple Mount, and the walls. Considering tomorrow we will start to explore the Western Wall (a.k.a. The Wailing Wall). After some quite steep road down to the church entrance, we go straight to this viewing point as seen above. There they provide some bench where we listened to some story of the ancient city of Jerusalem, especially that area within the walls before we go inside tomorrow. Actually, there’s more space to the right where it’s more crowded with tourists taking pictures and stuff. I guess this church is pretty famous for tourists to visit, quite a lot of people. But some interesting short story, the wall was actually rebuilt by the Ottoman Empire in 1535, when Jerusalem was part of the Ottoman Empire, Sultan Suleiman I. Which took 4 years between 1537 and 1541. The length somewhat around 4,000 meters and contain 34 watchtowers and seven main gates open for traffic. Now the wall is listed as one of the UNESCO World Heritage Site in 1981. And it serves mainly as a tourist attraction. The story moves to what’s inside the wall, describing the Old City, the Western Wall, the Temple Mount, etc. Of course with all the conflicts happening about that sacred area between Muslims and Jews. I will do a more in-depth blog post about that when sharing about Temple Mount. Meanwhile, you can watch this short video just to take a glimpse of what’s really happening and why such conflict. Maybe you questioned, why bother telling stories now about the center of Jerusalem in that place instead of when we visit that place. I guess that’s the one thing that made Mr. Dani deserve a title as one of the best guide in Israel. He gave us an intro now so tomorrow when we visit inside the wall, we don’t have to waste our time to gather and listen to another story. We can have more time inside which is more effective. Thank you, Mr. Dani! I don’t have much to share about this place since there’s not really that much of a story itself from Mr. Dani. 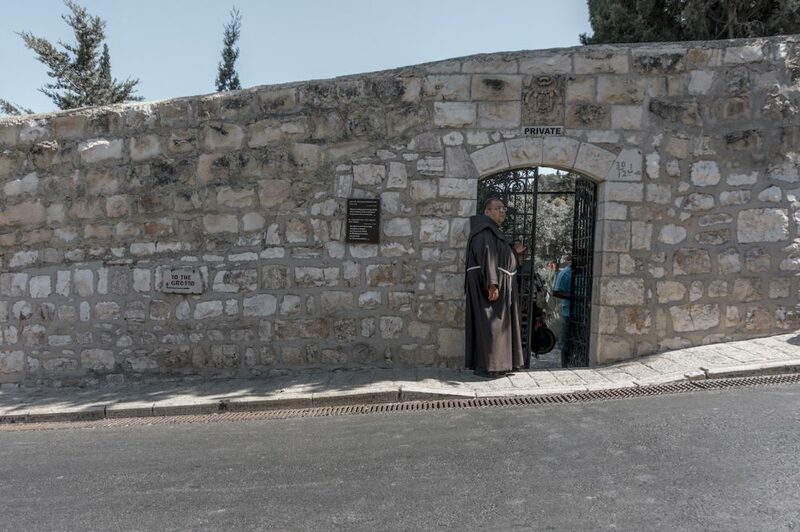 The site of Christ’s weeping was unmarked until the Crusader era. It was during this time that people began commemorating the site. Eventually, a small chapel was built there. After the fall of Jerusalem in 1187, the church fell into ruin. In the early sixteenth century a mosque or madrasah existed at the site, presumably built by the Turks, from the remains of the earlier church, although the exact use is disputed. This place was known as el Mansouriyeh (The Triumphant) and also el Khelweh (The Hermitage). The Franciscans were unable to obtain the ruins, so, in 1891 they purchased a small plot of land nearby and built a small chapel there. In 1913 a small private home was built in front of the Franciscan chapel by one Miss Mellon. This home eventually passed to the Sisters of St. Joseph, who eventually sold it to a Portuguese woman. We didn’t even explore everything inside this area, although Mr. Dani asked whether we want to look around or straight to the next stop. Again with the steep way down the road where we will make our next stop at the Church of All Nation. We passed a lot of Jewish graveyards. It’s for Jewish priest or rabbi or something like that. A couple minutes later we arrived at the Church of All Nation. Turns out that we passed the Gethsemane park first. The side entrance is a small door where a lot of locals selling souvenirs and stuff. View from the side entrance that we enter. For women, one thing that you should pay attention. Wear a proper outfit. 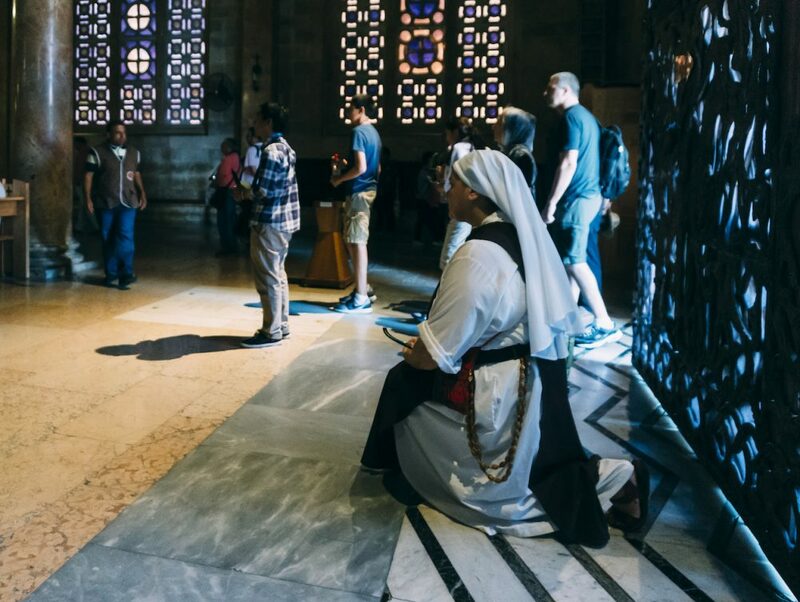 Since it’s considered a holy site, you should be a considerate visitors. Follow their rules, alright. We had this one lady who seems like she’s not getting the instruction from Mr. Dani yesterday. Either that or she’s just being ignorant. Wearing a short jean, she was not allowed to enter, which then slow us all down because we have to wait for her. There’s a couple local selling scarf or something like that for visitors who cannot enter because of their inappropriate clothing. I don’t know how much is it, but I assume it’s somewhere around $5 -$10. The oldest tree in Gethsemane park. You will notice a huge tree that draws attention and people taking photos of it. 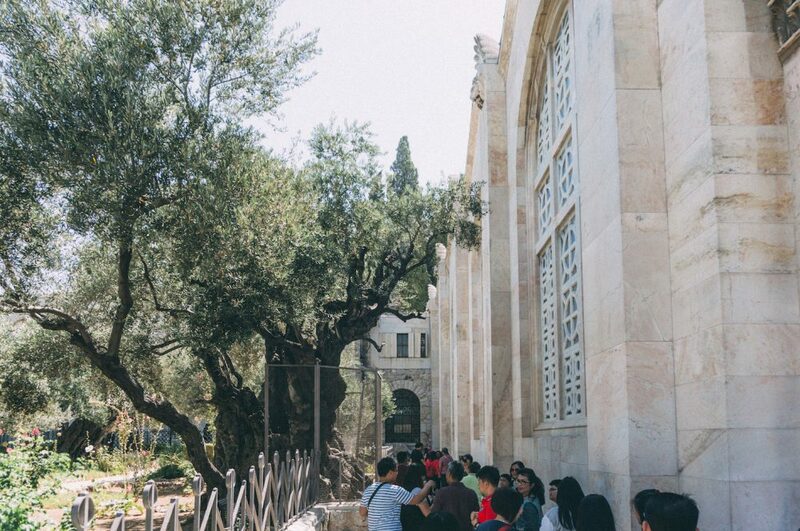 According to the officials, it’s one of the oldest olive trees in the Garden of Gethsemane. There are 8 giant olives trees used to known, only 5 of them are remained and 3 out of 8 are successfully dated. We cannot enter the garden, I’m not sure if it’s closed for public or just because there was maintenance. But looking from outside, the garden is clean and beautiful. But the crowd, though. 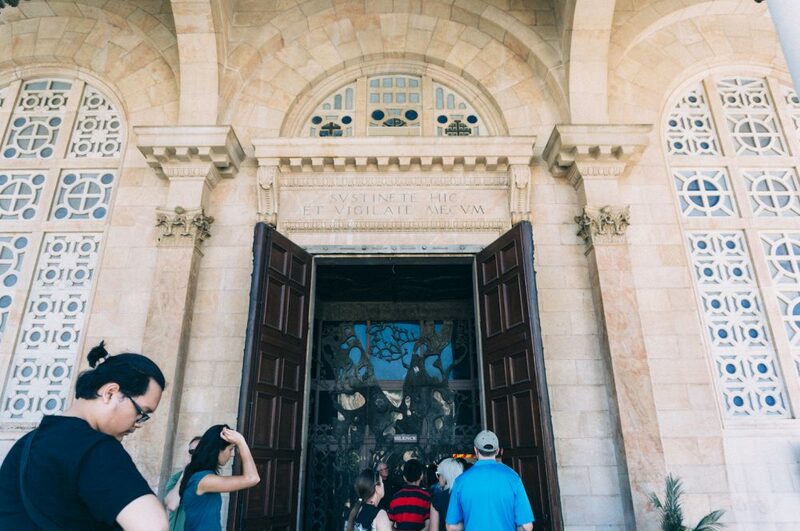 Garden of Gethsemane is famous for the place where Jesus come and pray the night before His crucifixion, where the disciples fell asleep. The name is derived from the Aramaic (Gaḏ-Šmānê), meaning “oil press”. 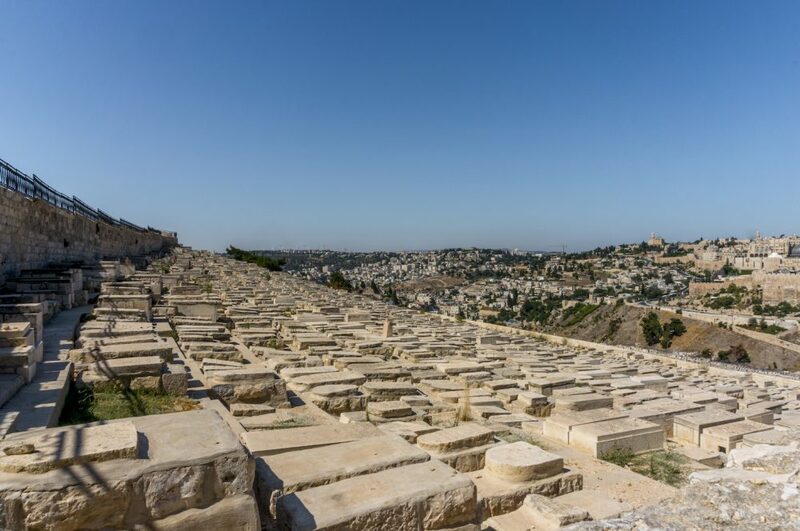 According to the Eastern Orthodox Church tradition, Gethsemane is the garden where the Virgin Mary was buried and assumed into heaven after her dormition on Mount Zion. My first impression of this Church was, “My God, this is magnificent…”. It’s huge and it surely looks splendid, majestic and glorious. The beautiful art at the front side of the church is really drawing attention. 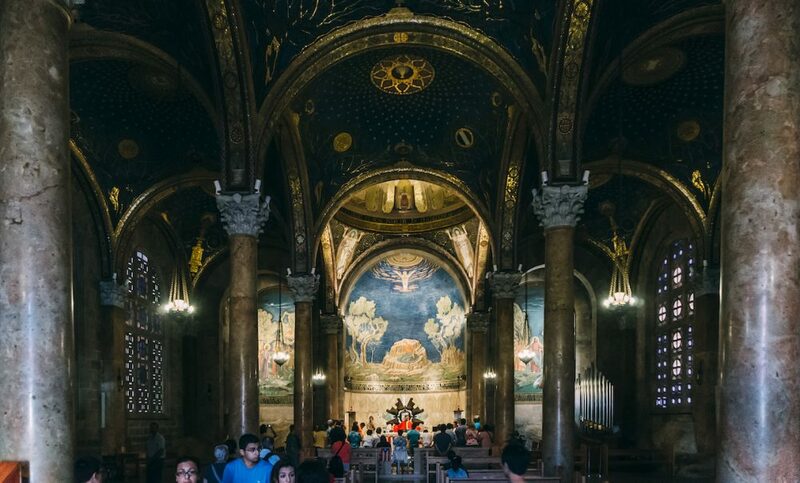 This Church is also known as the Church or Basilica of the Agony, a Roman Catholic church. Literally next to the Garden of Gethsemane. Tourists or pilgrims usually visit both places at the same time. 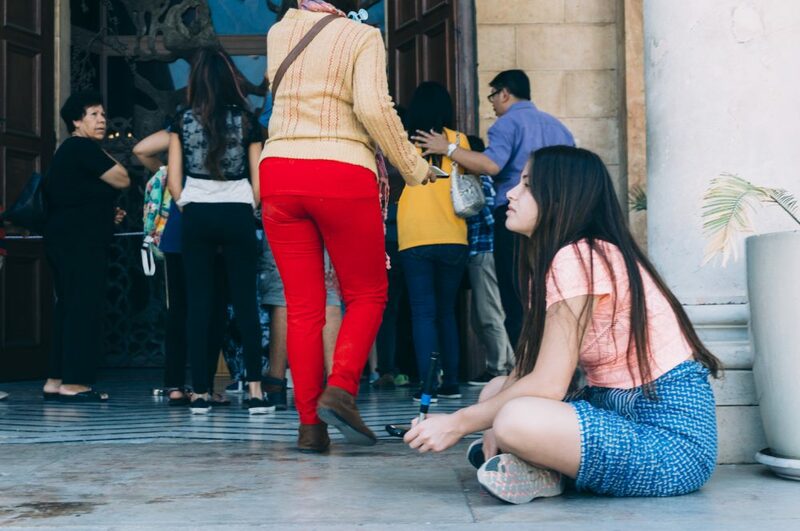 A girl chillin’ in front of the Church entrance. It’s a splendid chillin’ place indeed. Entrance door to the Church. An open altar located in the gardens of the church is used by many Christian denominations including followers who are Roman Catholic, Eastern Orthodox, Armenian Apostolic, Protestant, Lutheran, Evangelical, Anglican, and any other version of Christianity that is culturally unique to any particular nation. A Church of All Nation it is. A priest who constantly keep an eye over visitors. A worship session inside the Church. There was a worship session going on, so we cannot get too close to the front. But it was quite dark inside and absolutely beautiful. Why Church of All Nation? The church was built between 1919 and 1924 using funds donated from many different countries. The coat-of-arms of twelve of the countries from which donations originated are incorporated into the ceiling, each in a separate, small dome, and also into the interior mosaics. The countries honored in this way are, east to west (altar to entrance) and beginning with the northern apse: Argentina, Brazil, Chile and Mexico; in the middle of the church are commemorated: Italy, France, Spain and the United Kingdom, and to the right: Belgium, Canada, Germany, and the United States of America. The mosaics in the apses were donated by Ireland, Hungary, and Poland. The crown around the bedrock itself was a gift of Australia. These multi-national donations give the church one of its present names as the “Church of All Nations”. Even with those people kept coming in and going out, there will always be an original moment. I saw this sister coming in and tried to ignore the crowd, took a knee and started to pray. 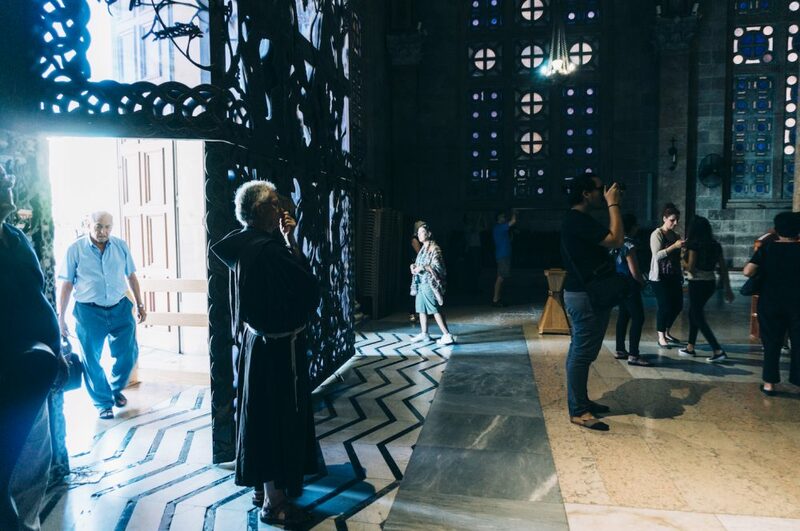 The moment was original and I think that we who visits the church should be more considerate to those who really want to come and not just taking photos or sight-seeing. Done with this Church, we’re all gather at the stairs in front of the church for a group photo. A lot of people sitting there, well, it looks great. Cannot blame them for taking a lot of photos. We’re waiting for our bus because there’s no parking at this site, that’s why we’re walking from the Chapel of Ascension down to this Church of All Nation. Our next stop will be the pool of Bethesda, where according to tradition it was the place of healing. Jesus healed the paralyzed man who cannot enter the pool by himself. I will cover the story later in the next post. I hope you enjoy this as much as I enjoy sharing this. Thanks for reading! Don’t forget to share. Until next post, bye! Never forget travel insurance if you’re traveling. Also learn more about how you can get insurance cover while traveling.